For events in the most recent episode of Doctor Who, Charlie Jane Anders has put the blame squarely on the Doctor’s shoulders. I respectfully disagree. We’ll be covering the newest episode (as well some classics) to look at what happened, how it happened, and where the blame lies, if any. Spoilers below. To keep things simple: Rigsy, a friend of Clara’s we met last season, calls her and the Doctor for help. He’s been charged for a crime he doesn’t remember committing. His sentence? Ashildr (Hi Ashildr!) has put a magic tattoo on his neck, counting down to his death. He’s a dead man walking. The rules of the magic (sufficiently advanced technology, yadda yadda) tattoo are deceptively simple: When it counts down to zero, the avian metaphor for death flies into your chest, and you die. If the would-be victim and a second party both agree to it, the tattoo can be transferred. Which Clara does. She takes up Rigsy’s sentence... without telling either Ashildr (the person who actually understands how the magic works) or even the Doctor, until it’s too late. She’s 100% confident she and the Doctor can break the spell in time. Unfortunately, since she leapt without looking or consulting anyone, Ashildr can’t undo the tattoo, so Clara dies. Her motivation is clear— she’s trying to protect a friend with baby. That much is noble. But the fact that she took up her own plan, knowing her life would be at stake, without consulting the Doctor or Ashildr, was lethally cavalier. Charlie Jane argues that the Doctor was the one to put these pieces in motion. He made Ashildr immortal and left her to her own devices, he turned Clara Oswald from a timid babysitter into a thrill-seeker. These statements are both true. Where I disagree, however, is that Clara’s death is the Doctor’s fault. The Doctor has lost other companions in time and space before, but the only occasions where his companions died were the results of their own choices. The 1st Doctor’s companion, Katarina, was taken hostage in The Daleks’ Master Plan. Rather than let her captor use her as leverage against the Doctor, Katarina blasted both herself and her kidnapper out an airlock. Adric famously died at the end of Earthshock, aboard a spaceship that crashed into Earth and wiped out the dinosaurs. Like all the others, Adric’s death could have been avoided. In his case, he was too stubborn to get off a crashing ship when the getting was good. Adric’s confident he can pull the ship out of disaster if he can just solve enough math problems. (The ship controls were routed through a computer locked by math problems. It was a whole thing.) No, seriously. The crew is right behind him, begging him to come with them before it’s too late. He doesn’t listen, and dies minutes later. That’s. About. It. Which brings us back to Clara. When she first started traveling with the 11th Doctor, she stayed put when the Doctor said “Stay put”. It was incredible. No other companion had ever actually done that. The usual companion MO was to wander off, get captured by the monster of the week, and need rescuing. But Clara’s grown much bolder, this season. Watching the earlier episodes, I found myself thinking, “What’s gotten into her? This isn’t like Clara.” And the Doctor has reprimanded her about that exact trait, taking unnecessary risks. He tried to correct something he saw as dangerous behavior. He regenerates when he gets it wrong. Clara doesn’t have that luxury. 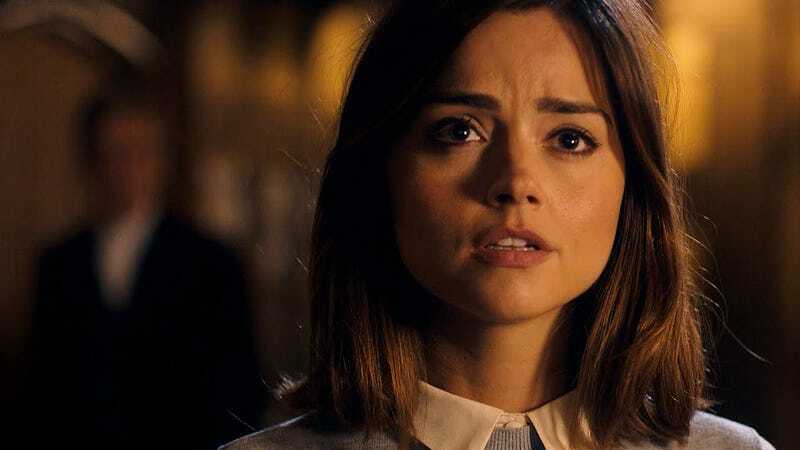 If the Doctor is guilty of anything, it’s being unable to say ‘no’ to Clara. He’s like a doting father— he’s inclined to overlook her destructive impulses. No one ever said traveling with the Doctor would be safe. And in her last moments, Clara admitted that she might have been courting a death wish, since she lost Danny. To wit: The Doctor is far from perfect, but the only times his companions have died were when they took their lives in their own hands. That being said, it wasn’t so long ago that Clara splintered herself across the Doctor’s entire timeline. It’s entirely possible he’ll run into her again.